SPRINGFIELD, Mo. (Reuters) - In rally after rally, President Donald Trump exhorts throngs of red-hatted supporters to treat next week’s congressional elections as a referendum on Trumpism and the grass-roots movement that swept him to power. The plea speaks to the challenge facing the president and his supporters: With Democrats threatening to take over the House of Representatives and key governors’ offices, the success of his legislative agenda over the next two years hinges on whether he can energize his backers around candidates who are not named Trump. This year’s election is the first real test of whether the coalition behind Trump’s “Make America Great Again” slogan can evolve from a diffuse, personality-driven following to an organised political force able to boost candidates outside his electoral strongholds. 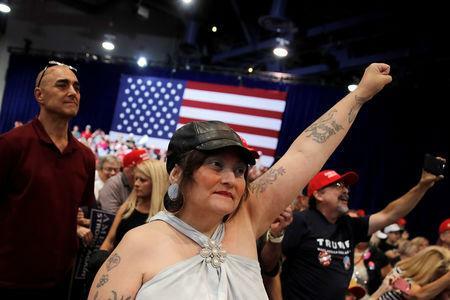 Reuters surveyed officials from 18 Republican campaigns, analysed data from polling partner Ipsos and interviewed dozens of candidates, strategists and Trump supporters to assess the reach and influence of the president’s self-styled “MAGA Movement” ahead of the elections. United behind Trump’s “America First” agenda of tighter borders, protectionist economic policies and unilateralist diplomacy, the MAGA coalition swept up 2016 voters who felt ignored by Washington and welcomed Trump’s vows to upend its institutions. Today, it attracts Tea Party conservatives, evangelical Christians, gun rights advocates, and working-class voters drawn to Trump’s outsider persona. Trump’s populist base is firmly established in the mostly southern and western parts of the country where he’s most popular. MAGA supporters turn out in force for Trump-backed candidates in those areas, boosting them in opinion polls and volunteering for their campaigns. In some cases, they have taken control of state party machines, harnessing their infrastructure and money for candidates in Trump’s mould. 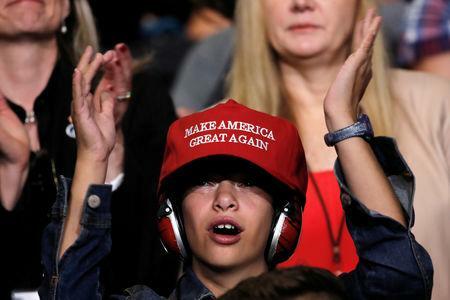 But outside of Trump’s strongholds, the influence of MAGA supporters is more pocketed, especially in Rust Belt states, such as Pennsylvania and Ohio, and the upper Midwest. So, while Trump loyalists can tip the scales in specific U.S. House districts in those areas, they have done less to boost Trump-backed candidates in statewide contests for governor and U.S. Senate. With no central organization and little regard for Republican hierarchies, MAGA enthusiasts agitate largely through social media and Internet forums, such as Facebook and Reddit, the social networking site. In dozens of interviews, Reuters found their willingness to back local campaigns often has less to do with party loyalty than with helping Trump. “The 2018 elections will be a test of how popular Trump is, how popular his policies are, did we organise well or do we need to do better and improve things for 2020,” said Scott Presler, a MAGA activist in Virginia Beach, Virginia. Among the 18 Trump-endorsed Republicans running for Senate or governor in states where Trump won the presidential race by more than 10 percentage points in 2016, more than 80 percent are ahead in opinion polls, based on data aggregated by RealClearPolitics and 538.com, non-partisan websites that gather polling from multiple sources. Yet among the 16 Trump-backed candidates for Senate or governor in states where he won by fewer than 10 points, just four – a quarter – are polling ahead. The challenge is starkest where Trump-backed candidates are trying to flip governors’ offices and Senate seats held by Democrats, Reuters found. In states where Trump won by double digits in 2016, two of the five candidates he has endorsed in races for Democrat-held Senate and governors’ seats are leading in the polls, and two others are within a few points. But in states where Trump won by less than 10 points, all six candidates he has endorsed in races for Democratic seats are behind in recent polls, five of them by at least 10 points. Through much of the campaign season, Trump supporters in many places were “leaning on their shovels,” because they were over-confident of victory, Steve Bannon, a former Trump adviser and campaign strategist, told Reuters. The president remains enormously popular with that base - Reuters/Ipsos polling gives him an 84 percent approval rate among Republicans - and more than two-thirds of those who voted for him in 2016 say they identify with MAGA ideals. That raises questions about the future of MAGA once Trump leaves office. On Oct. 1, Trump whipped up a crowd of nearly 10,000 at a rally supporting Marsha Blackburn’s U.S. Senate campaign in Tennessee, where Trump won in 2016 by 26 points. “A vote for Marsha is really a vote for me and everything that we stand for,” he told the audience. Soon after, opinion polls showed Blackburn, a U.S. House member, pulling ahead of her Democratic opponent, former two-term governor Phil Bredesen. “We knew President Trump would be an extraordinary surrogate in East Tennessee," Republican Party spokesman Garren Shipley told Reuters. Bredesen’s campaign dismissed the polls: “The only poll that matters is on election day,” said spokeswoman Alyssa Hansen. It was Trump’s second rally with Barletta since August. But Barletta, also a U.S. House member, trails incumbent Democratic Senator Bob Casey, and has remained behind by more than 10 points in polls. The divergent fortunes of Blackburn and Barletta reflect the challenge in harnessing Trump’s MAGA coalition. Following Trump’s victory in 2016, Tennessee’s Republican establishment embraced his agenda and welcomed his supporters. Many are volunteering now for Blackburn and other Trump-backed candidates, helping with phone banks, neighbourhood canvassing and other get-out-the-vote efforts. In Pennsylvania, where Trump’s 2016 win was razor-thin, his support is mostly concentrated in rural and working-class areas. Polls show Trump’s pick for governor, Scott Wagner, running well behind incumbent Democratic Governor Tom Wolf. Trump is drawing people to congressional campaigns in Pennsylvania, but they are coming “very tentatively,” says Eugene Sorrentino, 76, a retired power company technician and member of the local Republican committee in Erie, Pennsylvania. Sorrentino recently staffed a welcome tent set up by the party at a county fair and “all I heard was requests for Trump paraphernalia,” he said. The congressional races “weren’t on their agenda,” he added. In Trump’s strongholds, his ability to help candidates goes beyond a bounce in the polls. Nearly all the Trump-backed campaigns contacted by Reuters reported a surge of volunteer activism – a “Trump bump” – after the president’s endorsement. In Western Pennsylvania, a corner where Trump is enormously popular, U.S. Representative Mike Kelly says his campaign relies heavily on MAGA volunteers. Kelly’s district, redrawn this year, includes counties where Trump won by as much as 20 points in 2016, according to PlanScore.org, a nonpartisan group. Trump provides “that shot of adrenaline you need from time to time,” Kelly told Reuters as he prepared to join the president for an Oct. 10 rally in Erie. One engine for turning out Trump’s base in his stronghold regions is America First Action, a “Super PAC” allowed to spend unlimited amounts of money on elections. The group has spent more than $26 million on phone messaging and advertising in five battleground Senate races – Arizona, Montana, Indiana, Missouri and North Dakota – and across 11 congressional districts in Texas, Minnesota, Maine, Michigan, West Virginia, New York, Pennsylvania, Nevada and North Carolina. It is run by Trump loyalists and relies on big donations from Republican Party stalwarts, including casino magnates Sheldon Adelson and Steve Wynn and mining engineer and businessman Robert Murray. At the national level, Republican Party officials have fallen in line and embraced the president, routinely echoing Trump’s nationalist campaign themes. But for candidates in areas where the president doesn't dominate the electorate, embracing Trump has mixed success. In Florida, where Trump prevailed by one point in 2016, he endorsed Republican gubernatorial candidate and die-hard supporter Ron DeSantis before the party primary. But now, in a state that hasn’t elected a Democratic governor in 20 years, DeSantis is polling slightly behind in the general election contest against Andrew Gillum, the Democratic mayor of Tallahassee. Some Republican candidates in areas with moderate voters who view Trump less favourably have steered clear of the president, a Reuters analysis found last month. MAGA supporters have become a force in many state party offices, including some states outside the president’s established southern and western strongholds. In Ohio, a swing state where Trump won by eight points in 2016, the state Republican Party selected Jane Timken, a Trump friend and loyalist, to take over as chairwoman in the wake of the election. 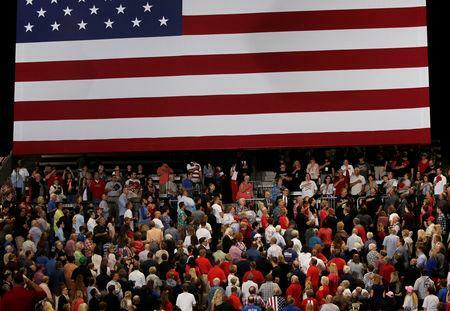 In Nevada, where Democrat Hillary Clinton won the 2016 presidential vote, the state Republican Party has launched weekly events, such as MAGA Mondays and Trump Tuesdays, to attract the president’s supporters. Yet even as MAGA supporters have become woven into the fabric of the Republican Party, many acknowledge it will be a challenge to preserve their coalition and continue shaping U.S. politics once Trump leaves office. In a Reuters/Ipsos poll earlier this month, more than a quarter of Trump voters said they did not know who would carry Trump’s vision if he leaves politics.